You are currently browsing the tag archive for the ‘Eureka’ tag. The Eureka Police Officers Association (EPOA) represents the rank and file employees of the Eureka Police Department. We are privileged to serve the City of Eureka and all of its citizens. The Eureka Police Officers Association is proud to announce that it will endorse Allison Jackson for Humboldt County District Attorney. The Eureka Police Officers Association believes this election will have a significant impact on the City of Eureka. Quality of life, community safety and victim’s rights are all at stake in this election. The Eureka Police Officers Association believes change is needed in how criminal cases are dealt with within our community. A case in which a suspect, already on probation and with a prior DUI conviction, hits and kills a pedestrian crossing the roadway in a crosswalk in downtown Eureka. The suspect faced a potential prison term of 2 – 6 years; however, a plea agreement was reached resulting in a 1 – year jail term and additional count of felony probation. A case in which a suspect, on parole, brandished a firearm at a citizen. Officers subsequently located the suspect parolee who was still in possession of the firearm and ammunition. The suspect received a plea agreement of 16 months in prison versus the 6 – 9 years he could have received upon a jury conviction. The Eureka Police Officers Association firmly believes that District Attorney Candidate Allison Jackson will bring much needed professional change to the District Attorney’s Office if elected. The Eureka Police Officers Association strongly urges citizens to vote for Allison Jackson for Humboldt County District Attorney. Please join Frank Jager at his fundraiser tomorrow (Thursday) night at Angelo’s Pizza Parlor, located at 215 W. 7th Street (2 blocks west of Broadway/101) in Eureka from 6-8 pm. A $20 donation gets you pizza and beer the opportunity to chat with our next Eureka Mayor. 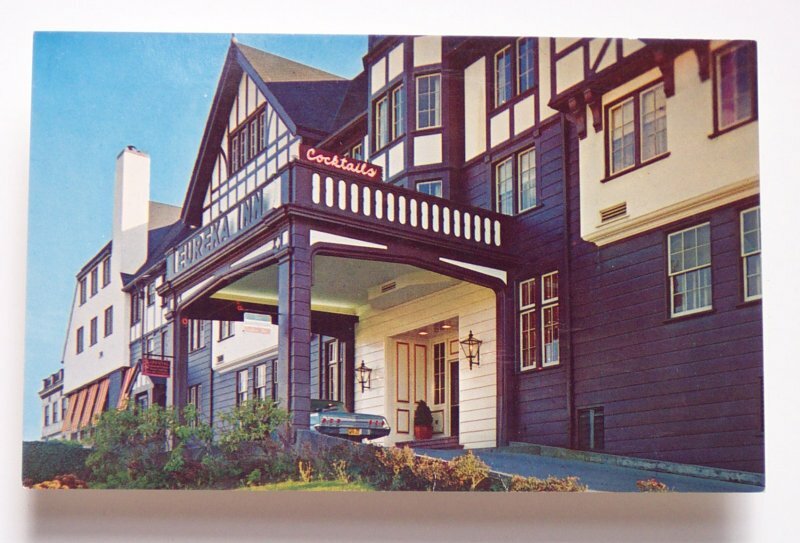 The NCJ Blogthing reports that the Eureka Inn reopens tomorrow, with some very affordable promotional rates! I didn’t even know that was in the works. Quick food note. I recently visited the Banana Hut for the first time following it’s move from Redwood Acres. It’s now located on 5th Street in Eureka across from the Post Office, but they really need to make themselves more visible with a sign. Or maybe they don’t. I was there at 5:30 on a Thursday evening and it was packed. The co-owner, can’t remember his name, is really having a good time with the business and wandered from table to table shaking hands and conversing with great humor. The decor is fun. A little gaudy but fun. On the evening in question he had three waiters and one waitress in Hawaiian shirts and clearly enjoying themselves – probably two more than needed. I also noted at least three cooks in the kitchen. It’s worth supporting just because the owners are willing to spread the wealth a bit in a rough economy. And the food is exceptional. They have a liquor license now and I saw plenty of the primary colored drinks with little umbrellas. I enjoyed the Korean chicken with a terrific glass of a cabernet of grapes grown in Hawaii – having fortunately overcome my skepticism to order. They offer a discount card (10 meals purchased, one free). The diversity of Eureka was well represented at the time of my visit. Looks like the restaurant is on its way to becoming an institution. I was listening to the Point (FM 100.3) during my rounds in Nohum today. Usually I listen to KGOE, unless it’s during the Dr. Laura hour when I switch over to one of the right wing stations. Today I just wasn’t up for the blather. The music on the Point is pretty much what I heard in high school and it brings me back. As I think I’ve said, they play a little too much Pink Floyd. As I was listening to Another Brick in the Wall, I reflected as I have in the past on the hours I spent as a teenage stoner listening to Roger Watters whining about all the mean women in his life, with an emotional spectrum about as narrow as any manic depressive who refuses medication. But I find I can filter the lyrics and listen for David Gilmore’s guitar solos throughout the Wall album – some of the most beautiful sounds heard on the planet. Sometimes you have to take the beauty with the ugly. Speaking of the latter, have I just not noticed how oppressively ugly is the Jack-in-the-Box on Broadway? Has it always had so much red? I’ve just noticed it on my past couple of visits. Maybe it was the lighting. Thank God Napa’s is gone, or that whole neighborhood would look like a Yuba City sprawl decked by Walt Disney. I haven’t eaten at a Jack-in-the-Box since I was a kid; and actually I’m not sure I’ve ever eaten at one. I remember the Rodney Allen Ripple commercials as a kid. I probably won’t ever eat there after the salmonella deaths in Washington State some years back. But I can tell you that the building does not look inviting to me. Hint for those with business in the Courthouse – the lines at the security entrance on 4th Street are almost always shorter. Parking is easier on that side too. At least it was before this post. Here’s a clip from last Saturday’s Perilous Plunge previously reported on this blog. Bear River Casino employees jump for the Discovery Museum. Eureka City Councilman Larry Glass is calling for a ballot measure to determine whether the city should continue to pour half a million dollars into the zoo. There is enormous concern for health and safety as departments are facing slashes in their already bare-bones budgets. Obviously it’s not an easy choice . But I hope Eurekans and their leadership think hard about it, because once it’s closed it probably can’t be reopened. Revenues are obviously down due to the economy, and I hate to see permanent decisions made on the basis of short-term budget issues. On the other hand, that’s a great deal of money for a city of Eureka’s size to put out. The county is facing declining schools enrollment as it has less and less to offer families in terms of job opportunities and recreational offerings – the zoo’s potential demise following the closing of the Natural History Museum with HSU’s leadership apparently determined to kill it off no matter what anyone in the community says or offers to do. I do think the county should share in some of the financial responsibility, though it’s obviously strapped as well. Are there any applicable stimulus grants? I hope the city is looking into the possibility. Poor Bill is no doubt rolling in his grave. For those considered that zoos are speciesist concentration camps, they do serve a conservation purpose. The comments thread attached to the Times Standard article is the longest I’ve seen. The issue obviously touches a nerve. Right now 4th, 5th, 6th, and 7th Streets are one way. 4th and 5th represent U.S. 101 and I think they have to remain that way. But do 6th and 7th really need to be one way? I think it hurts the businesses on those streets and I wonder if there is traffic engineering data to justify it. Mayor Virginia Bass had nominated HumCPR leader Lee Ulansey to a spot on the Eureka Planning Department, but a nominee who is not a city resident requires 4 City Council votes. He received only three, with progressives Larry Glass and Linda Atkins voting against his appointment and several others. Larry Glass said he felt that the incumbents were doing fine, and Linda Atkins doesn’t think it’s a good idea to fill Planning Department positions with non-residents. Heraldo has a long thread with many comments made before everyone knew about the 4/5 rule. Eureka politics reminds me of Santa Cruz when I was in school there in the early 1980s. At that time the “conservatives” (by Santa Cruz standards) had been removed from power, but maintained 3 of the 7 spots over several split decision elections. The progressives could never quite consolidate their power, and the conservatives could never quite turn the corner. I learned that later in the 1990s politics took an odd turn when it appeared that progressives had finally consolidated, but then all of the sudden the mayor Mike Rotkin, a former SDS leader who teaches UCSC’s famous “Introduction to Marxism” class, became a best friend of developers. Santa Cruz has (or had) and odd term limitations provision which allows you to hold a seat for two terms, then you have to take two terms off before running again. Rotkin, with much union support, gets elected every time. Eureka’s last few elections have been split as well, with conservatives (by modern Eureka standards) maintaining a one seat majority. Since the elections for each position are all city-wide you have exactly the same voters putting both into office, which suggests that there are a large number of Eureka residents, at least enough to swing elections, who favor a slightly hands-off development policy tempered with at least some progressive oversight and regulation. But trying to interpret mandates can be tricky, especially when the rest of the city is polarized around an issue like the Balloon Track development proposal. At some point progressives will probably flip the council break down, especially if the conservatives are successful in pushing development which brings in more liberal baby-boomers from the south – the perennial irony of coastal California rural and suburban politics over the past few decades. Personally, were I a Eureka resident, I’d have no problem tapping non-residents for positions so long as the nominee’s policy priorities reflected those of the voters of the city, however that can be gauged. Ullansey is a nice and passionate guy with a lot of talent, but do the voters support a private property rights oriented libertarian approach to planning policy? Maybe one of these years Eureka’s election results will tell us. I only have this report, which doesn’t say much. Nothing so far on the ordinance proponents’ site. District elections are a product of the Progressive Era, though it’s taken a century for it to catch on in Eureka. It’s a great boost for grassroots candidates for obvious financial and organizational reasons. It has been vehemently opposed by entrenched powers in the history of the 20th century, as the reform undermined urban machines across the country, from the Daly machine in Chicago to Willie Brown’s in San Francisco. The “downtown” interests in the latter city managed to use the Moscone/Milk killings as an excuse to overturn district elections, but the progressives managed to get it reinstated in the mid-1990s and they haven’t looked back. In Chicago during the 1950s the Catholic Church regarded district elections as part of a communist conspiracy and suggested that it might be at least a venial sin to support them. The discussion has arrived in Eureka with two Times Standard articles (one – two) and a public meeting to be held in June sometime.